To celebrate her 90th birthday, Pangolin London is proud to present a major solo show of sculpture and works on paper by Charlotte Mayer. With an array of both early and new work, the exhibition highlights Mayer’s exceptional craftsmanship and relentless dedication to making sculpture. Born in Prague and emigrating to the UK in 1939 at the age of 10, Charlotte Mayer was one of only a few women to study at Goldsmiths and the Royal College of Art in the late 40s, at a time when women were not always welcomed into the sculpture studio. Her unquenchable energy and resilience however put her in a good stead and she started creating forms that were both visually arresting and emotionally expressive. The power behind Charlotte Mayer’s sculpture is her strong affinity with the natural world.Spending idyllic days in the garden of Das Rosel Haus (The House of Roses) where she grew up in Prague until the end of the 1930s, Charlotte learned about the rhythmic structures of nature and the patterns of the material world. Many of her sculptures are inspired by skeletons, seed pods, leaves, shells and ammonites, as well as bringing to the foreground the strength of nature’s elements. Mayer also draws her inpiration from meditation - the stillness and calm an important part of her creative life - making the spirit somehow present in the form. The complex constructions and elegant organic surfaces she has created over the years are imbued with strength, while also emanating serenity and poise, making her pieces instantly recognisable. 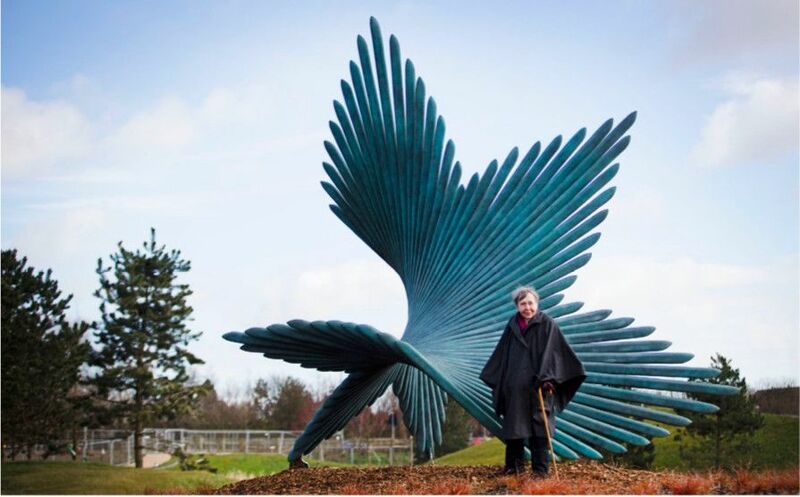 Charlotte Mayer has worked on numerous commissions, including two pieces for the entrance of BNP Paribas in London and a large bronze sculpture, Pharus, which was installed at Goodwood in Sussex in 2001 by the Cass Sculpture Foundation. Standing at just over three metres tall, Mayer’s largest public commission to date is a monumental ‘Turning’ sculpturewhich was unveiled in March 2016 at Bicester Office Park, Oxford.